A passion became an idea, and in November of 2017, Kkumi Project was officially born! 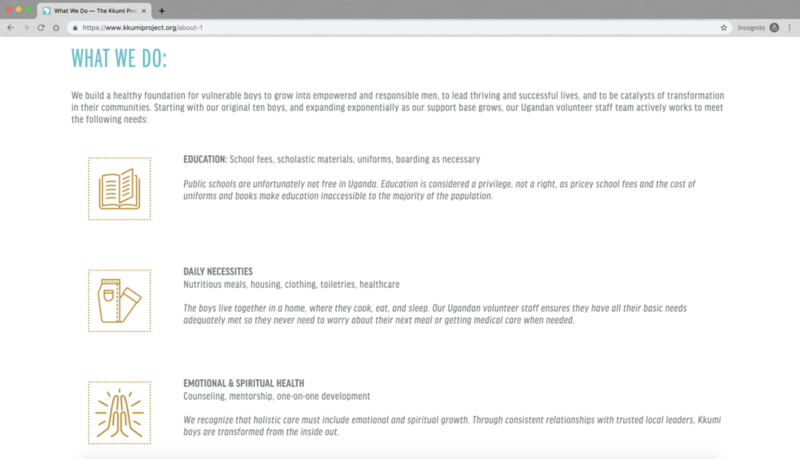 Kkumi Project collaborates with local leaders to strengthen their work of holistically transforming and empowering the lives of vulnerable boys and young men in Uganda. Kkumi means ten in Luganda, the local language spoken in the community where we work. I am honored to be a co-founder of this organization partnering with our incredible Ugandan team where the vision was first born. The current and original ten boys in the Kkumi Project have captured our hearts and we have a feeling they are going to capture yours too. They are strong, resilient and fierce. And they have taught us so much. I had the privilege of establishing our brand, developing our website, designing all of our print collateral and leading the charge on the vibe of our fundraising events.